Striving for world dominance, naturally the handheld market needed a shellshocker of its own to cash in on the incredible popularity of TMNT. 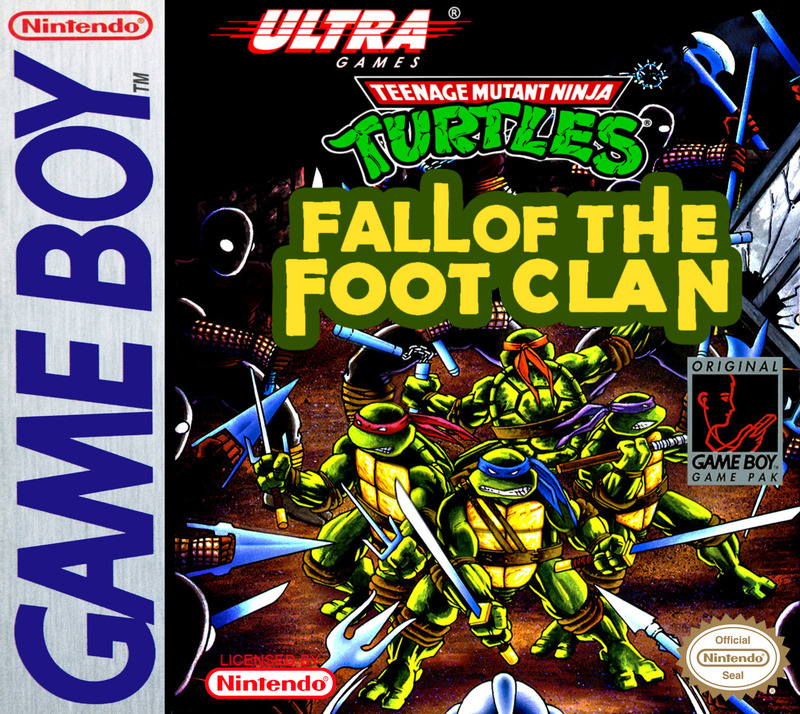 Enter Fall of The Foot Clan, the first TMNT game to appear on the Game Boy handheld system. The game was designed by Naoki Matsui, who had previously worked as a graphics designer on Vampire Killer and Gradius on the MSX. When Konami ceased their support of that system, the MSX team was formed into a Game Boy team, headed by Matsui. This was his first assignment under his new job title. 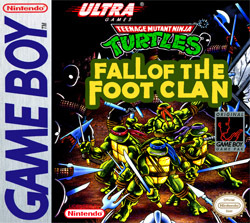 Fall of The Foot Clan is more or less a downsized and scaled back version of the NES game, basing itself around the same story with Master Splinter and April having been kidnapped by Shredder and the Foot, and the brothers setting out through New York to save them. The only major deviation is the stage that takes place in the Hudson River itself, though this time there is no bombs and no swimming required. 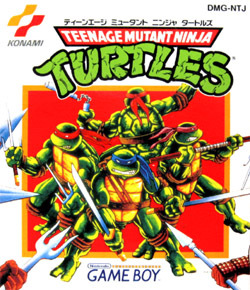 As expected the game lets you choose between all four turtles, though this time around it is strictly a single player experience with no ability to link up or take turns. Each turtle makes use of their respective weapons, and in addition to a strike with these they can also perform a flykick midair as well as throw an unlimited amount of shurikens by striking while crouching down. 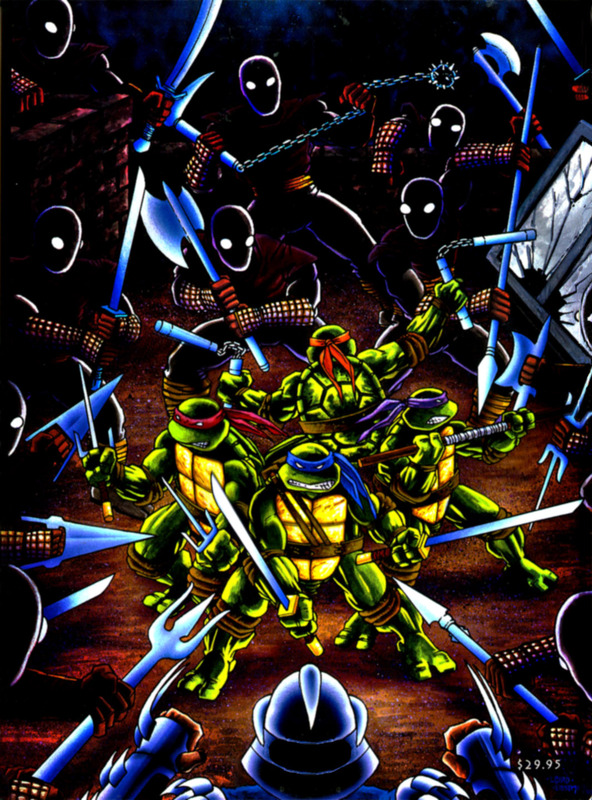 Apart from the visual representation of the weapons, there are no major difference between the way the turtles act or operate, being complete equals to one another. There are five stages in total, all being straightforward platform game material, with a bit of jumping over barrels and a few enemies jumping into frame for you to strike down. The standard enemy is the Foot Soldier, the mechanical ninjas as well as Wheel-Bots and Mousers. There are also some new enemies, such as the fantastically coined "Filet 'o Filth" and Rabbid Mad Bats. Each stage ends with a boss, which are all familiar names such as Rocksteady, Bebop, Baxter Stockman, Shredder and Krang. 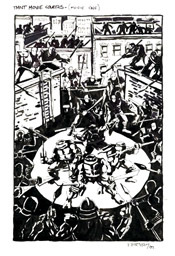 Fall of The Foot Clan seems to be something of a homage to Bad Dudes vs. Dragon Ninja from Data East. Not just in the similarity of gameplay, walking left and right to take out ninjas, but in the way the levels are set up. In Fall of the Foot Clan, the turtles go through the streets (and sewers) of New York, before taking to the streets on top of speeding trucks, before heading into caves and finally infiltrating the bad guys's lair, the Technodrome. Mirror that to Dragon Ninja, where you take on the streets, go on top of speeding trucks, go through a cave before infiltrating the secret ninja layer. There are some filler in between in both games, but the general set up is pretty much identical. With only five stages total, the levels themselves are a bit on the long side, often split into three different sections before the boss fight at the end. Here, you'll be challenged with all sorts of obstacles, be it the resistance from the Foot, to environmental hazards like falling blocks and spiked ceilings. There are multiple bonuses on each stage, from hidden pizzas to secret rooms with mini games to earn a higher score. These mini games consist of guessing the number Master Splinter has in mind, the second one is a fight with Krang (which begs the question why the TMNT don't just take him out during this friendly bonus game) where you have to take out as many stars as possible without being the last one to remove a star, and the third is a little target shooter. But, even for a handheld title, this game is all to short and all too easy. In fact it is so easy that it can be completed in less than 30 minutes even if you don't play at your fullest concentration. There is little challenge to the enemies or bosses, the game moves very slowly, so you always have the time to properly react and set up your attack. It does look great for its time however. Even though the Game Boy had been out for exactly one year by the time of its release, for the most part it was still dealing with first generation graphics with smaller sprites and minimal detail. Here, the sprites are filling near half the screen, and apart from some lack of diversity between the brothers, they look great, and so does most of the enemies. The boss sprites are truly gorgeous to look at, as they are huge and highly detailed, in some ways looking even better than the arcade versions from the year before. The backgrounds, whenever there is any, look very attractive as well. The music was handled by none other than future Symphony of the Night composer Michiru Yamane, though sadly the game doesn't ever gain much momentum in the sound department. There are some good original tracks, such as the eerie sewer tune, but for the most part it's an entirely forgettable soundtrack, and some of the sound effects are just deafening. Fall of the Foot Clan is an alright game considering the era it was released, and looks and feels much greater than, say, Kung Fu Master on the same platform. It just seems to suffer from being rushed, from its short length to the lack of proper backgrounds in many places and the lack of true diversity. Some enemy sprites are just taken from other games with little modification, leading them to look out of place, like the mini-choppers who are taken straight from The Arcade Game and look completely flat, to the rabbit bats that are just moved over from Castlevania Legends. It's fun though, no doubt about that, it's just not a classic game which makes you come back again other than for the nostalgia. 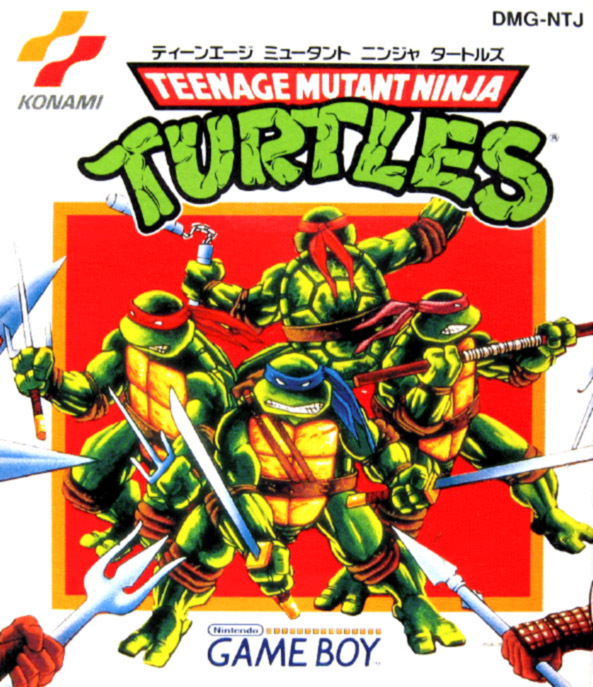 Konami seems to have been a bit confused as to what the turtles really are however. I guess it's easy to mistake them for something else, with their shiny, smooth heads with a small crease and a hood around it. Yup, you'll never unsee that one again. The cover art for this game actually has an interesting story. 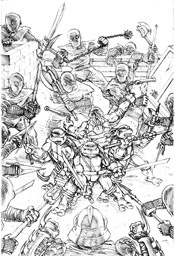 Originally set to be the poster art for the first live action movie, it was sketched by co-creator Kevin Eastman. However, in order to differentiate it from the cartoon and comics so that audience would understand this was a live action feature, it was shelved and put in the archives. It was later retooled and used as the art for this game. A year after the release of Fall of the Foot Clan, a sequel was produced based around much of the same premise as its predecessor. Taking over the directorial throne from Matsui was Fukui Hiroyuki, who would go on to work on several other cartoon properties on the Game Boy, such as Batman: The Animated Series and Tiny Toons. Even though in name it is stated as a sequel, the game itself is more or less an updated version of the first NES and Game Boy game. In fact, the title screen in both the US and European version excludes the numeral representation in the title in game, though the subtitle does allude to it being a follow up. Regardless, things are largely unchanged storyline-wise: April has been kidnapped and the quartet in a half shell have to go through New York to find her and the Technodrome. But the game hosts a number of much needed improvements in almost every other aspect. Like always, the choice between all four turtles is possible before any stage, but their range, strength and abilities have been increased. 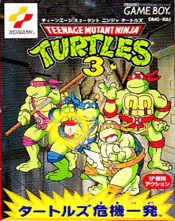 The usual roles are applied to the turtles, and added to their overall moveset is a special sliding kick, while the infinite shurikens have been replaced by a more effective jab. Turtles can even climb ceilings and interact more with the actual stages as the layout and progress of the game has been spiced up to create more exciting action. The enemy roster remains mostly the same, minus the Castlevania bats and the filthy filets. Graphically, the overall style hasn't just been improved, but reinvisioned somewhat to create a unique look and feel. Being based much more heavily on the cartoon show than any title before it, the turtles now look much more round and friendly, with big round eyes and comedic expressions. Contrasting in their art style is the enemies, looking darker and more menacing than any previous iteration - even the original comics in some regards. With evil, narrow eyes and an almost demonic appearance, these villains are probably the very best part of the artistic approach in the game, with Shredder looking lethal immediately when you see him. Krang literally fills up half the screen in some impressive sprite work for the Game Boy. In fact, the size and detail of everything from characters to backgrounds are among some of the best on Game Boy altogether. Even Master Splinter helps out and will deliver pizzas as well as fly the Turtle Blimp. Before each stage, there's the familiar title card found in the TV show as well as an early example of digitized speech in a Game Boy game. 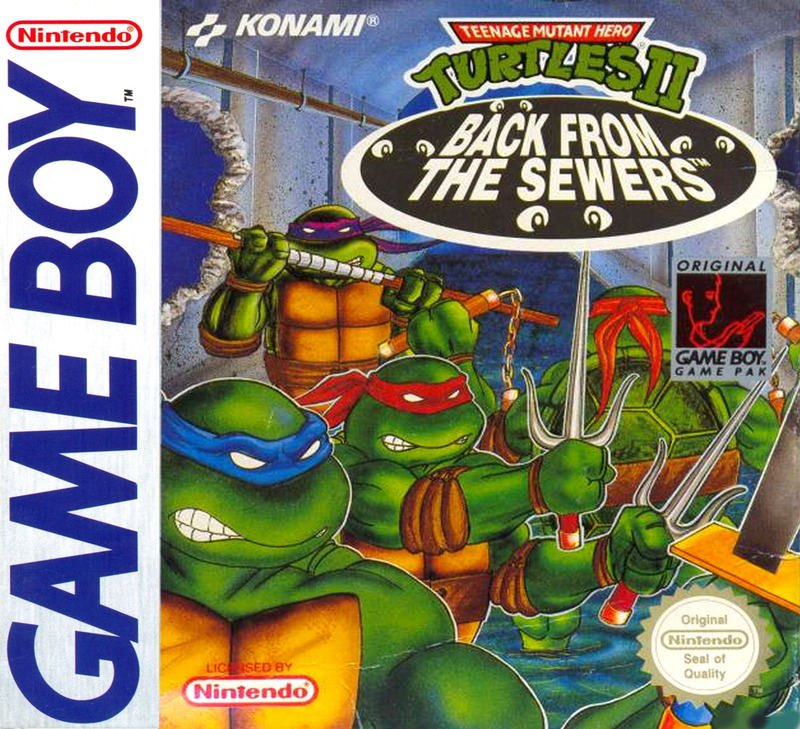 While the gameplay is quite familiar by this point and doesn't reinvent the wheel, it does bring back the NES feature of having turtles being captured upon defeat and the possibility to rescue them. In the first NES game, this was achieved by actively seeking out the captive member of the team and rescuing him, while in Back from the Sewers it is done through a bonus stage after finishing a stage. The selected turtle needs to defeat REX-1, the robotic police officer. If there are no turtles in captivity, you'll be rewarded with a pizza-dropping bonus stage. The stages are again broken into three separate sections, though there is a bit more going on in each of them, and the enemy patterns are far less predictable than the earlier games. Platforming is spiced up a bit more by introducing a ceiling crawl and also the ability to use acrobatics to thrust up railings and ledges, making it a bit more visual. Some stages also allow for the turtles to move up and down on larger playing fields. The music lives up to the quality of the graphics, being a perfect style of pop rock that gets the lighthearted adventure a good little push. While using a lot of the same motifs, there is overall more depth to each individual track here compared to Fall of the Foot Clan, like the Underground stages having deeper and more atmospheric tunes compared to the jazzier pop rock of downtown New York. The soundtrack was handled by Tsuyoshi Sekito, who would later go on to compose Brave Fencer Musashi for Square. Back from the Sewers is a game that looks at all the elements that worked in the previous games, meshes them together and further builds upon those ideas to craft a very enjoyable, neatly-sized game with lasting appeal and tons of authentic charm from what it is based on. Rather than trying to do a lot of new things that do not stick, it rather just focuses on the things that do work, and the result is one of the all-time best TMNT games available. 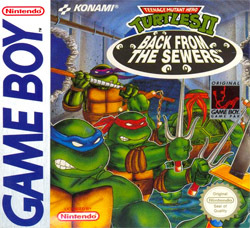 Though released in between the Genesis and SNES versions of Tournament Fighters, Konami's next TMNT adventure on the Game Boy would be an all-new exclusive adventure, not partaking in the Tournament Fighters marketing that was heavily in gear for the holiday season. Returning to its sidescrolling roots yet again, Radical Rescue is actually something of a milestone for Konami, a discovery of a genre which they would take advantage of some years later. Directed by long time Konami producer and key figure Hiroyuki Fukui, Radical Rescue is a side scrolling non-linear adventure game, putting the Ninja Turtles in the midst of a maze created by Shredder, who has escaped from his holding cell and kidnapped April once again. 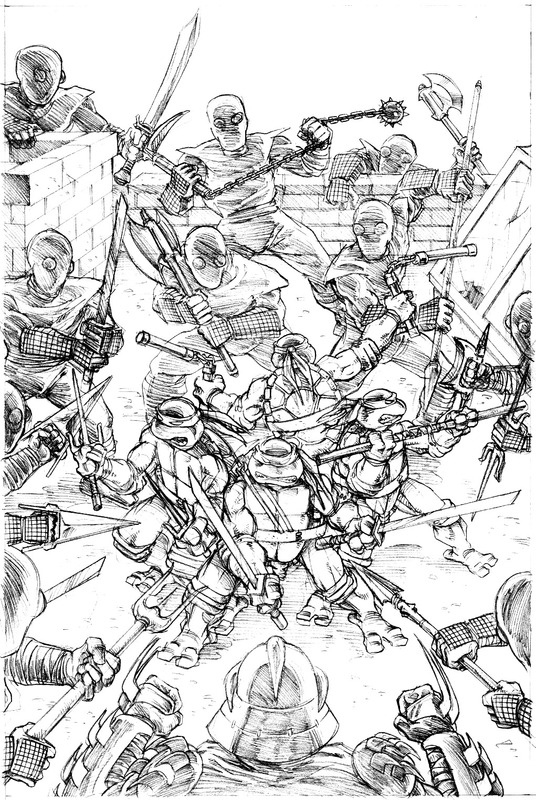 But for the first time ever, Leonardo, Raphael and Donatello have also been captured and locked up in Shredder's hideout, leaving only Mikey to come to the aid of his brothers and best friend. To start, Mikey is the only character available, and it's up to him to locate and free his brothers. Doing so requires some detective work, as keys are required to open their cells. Keys are only made available after defeating a boss character, and defeating them also opens up all new areas. 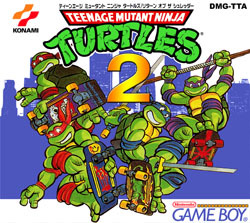 The turtles themselves need to cooperate appropriately to venture through the large maze by making use of their individual skills: Leo can drill into the ground with his katana, Raph has the ability to shrink into his shell and enter narrow passageways and Don has the ability to climb walls. Mikey, being the best of them anyway, can hover through the air by spinning his nunchuks. The most immediate comparison that can be drawn is naturally Metroid II, being that they share a home on the Game Boy. The set up of the game is very similar - a large open world, with unlockable skills (in this case in the form of characters), new areas from defeating bosses, and hidden items in boxes and crates. 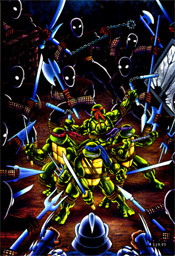 The boss battles are increasingly challenging as the game progresses and using the four turtles is required to survive, but the moment one turtle is defeated, the game is over. Unlike the prior game, there is no chance of rescuing your brother a second time around. Being that it shares similarities with a Metroid game, it also retains a lot of the issues found in that series' Game Boy iteration. The limited view is a drawback to a large open world game that requires exploration, and even though there is a sort of semi-linear structure, getting lost happens more than it should. Without the use of color, locations also look too similar, which becomes the largest issue with the game. Apart from the exterior section of the beginning moments, Shredder's fortress recycles an all-black background with a gray warehouse-type setting, with minimal changes made between locations. Radical Rescue also has some length to it, so you are dealing with literally hours of navigating similar locations to find the bosses. The game helpfully features a password system to resume gameplay. 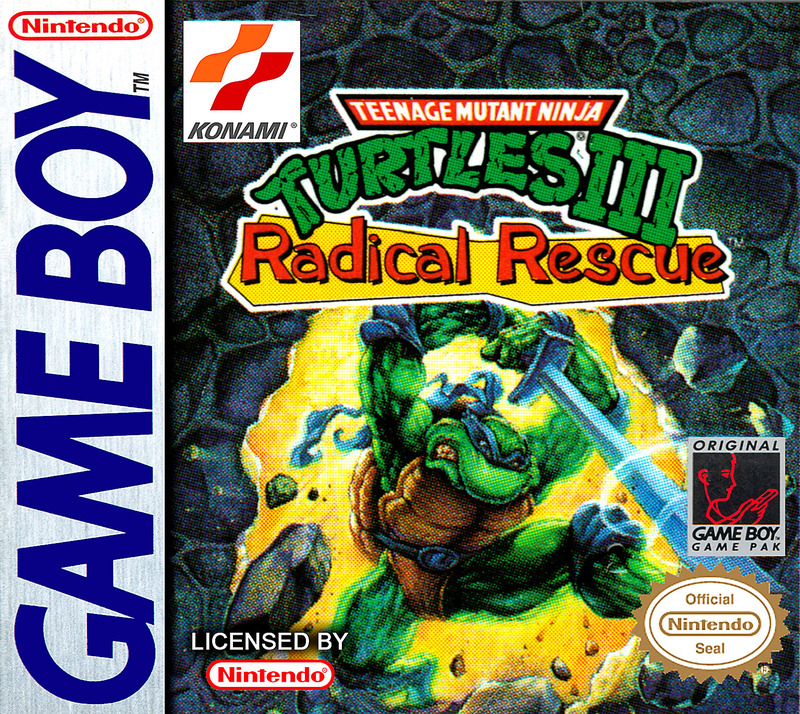 In terms of presentation, Radical Rescue scores high marks and is among the best in the series overall, handheld or console. Similar to what was done in Symphony of the Night four years later, the game's prologue harkens back to the classic template, being seemingly another side scroller through a standard level structure. It's only when Mike arrives inside the fortress that the game reveals itself to be something completely new to the series, and a very welcome change at that. 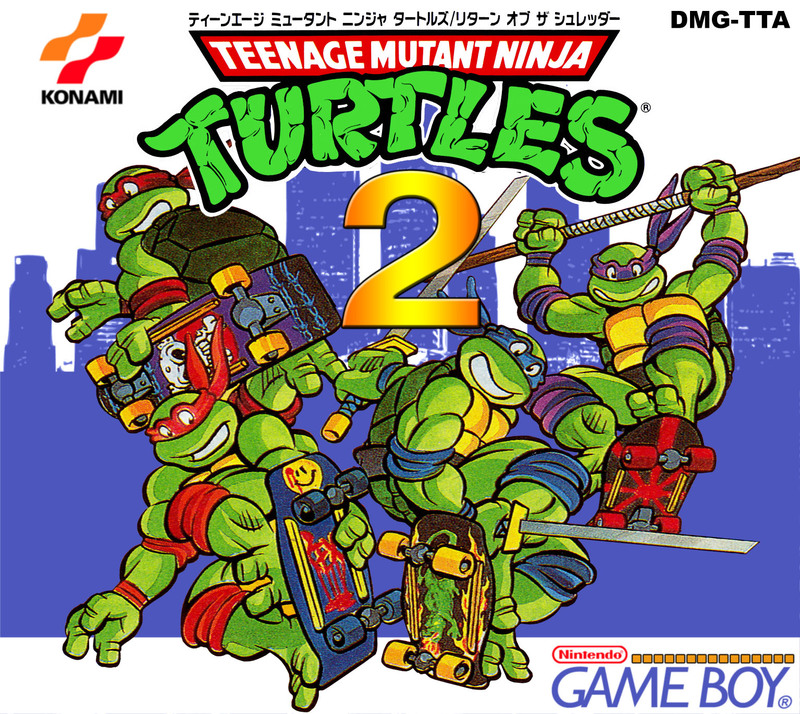 The character designs are based heavily on Michael Dooney's art and are among the best sprite work in a TMNT game, though the bosses contrast their darker appearance, being based heavily on their more cartoony toy versions. Even though the boss roster is smaller than usual, it is certainly the most interesting, using almost exclusively characters from Adventures or the toy line. Regulars Rocksteady and Bebop are not to be found, explained as being still in prison for the crimes committed in Back From The Sewers. The music is among the better scores found in a TMNT game, featuring the tried and true power pop affair, though with a noticeably darker edge to many passages. The soundtrack was handled by M. Matsuhira. It's definitely interesting to see an early precursor to Symphony of the Night come in the form of a TMNT game four years prior to the Castlevania classic, but it should not come as a surprise that many of the staff members of Radical Rescue would be part of SotN's production team, along with Hiroyuki Fukui in a producer role. Radical Rescue is a long, challenging and interesting game that on paper is suited for a handheld system, but it is sadly held back by the issues that come along with that platform and lack of diversity in the world structure. The graphics, the sound, and the challenge have held up great. however, and it's a more than worthy addition to any Game Boy collection. 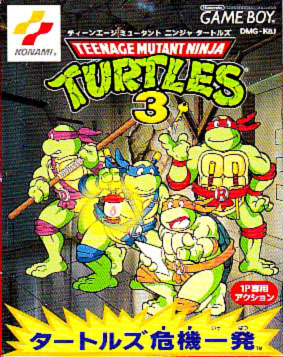 No changes were made to the Japanese release for the title, though it was released as Teenage Mutant Ninja Turtles 3: Turtles Kiki Ippatsu ("Turtles in Danger").